It looks like things are starting to pick up again for 2017 because we got a plethora of video drops this past week; featuring a wide range of artists and genres. 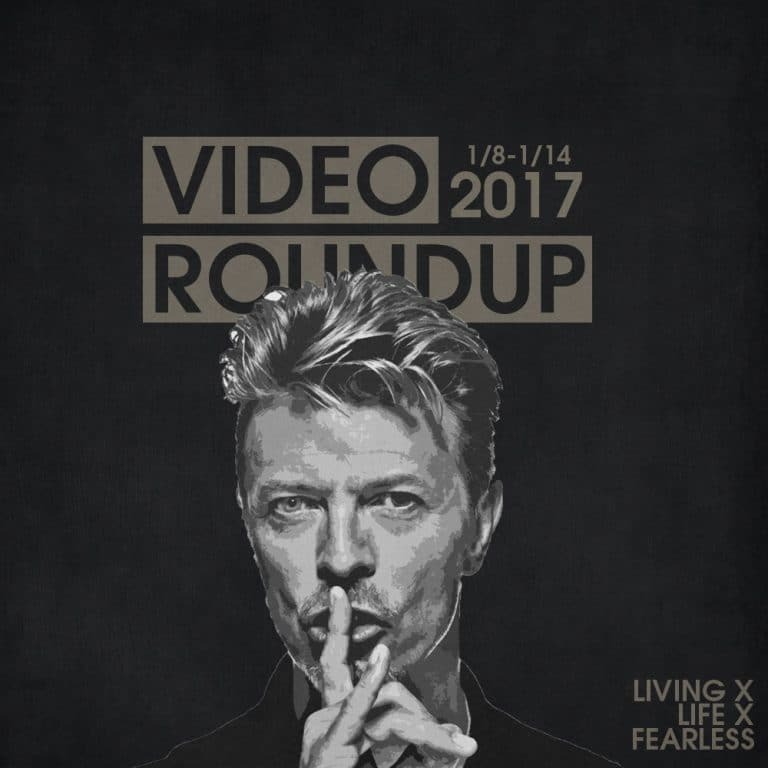 We got new videos from the likes of David Bowie, The Weeknd, Sean Paul, and more. Along with relative upstarts like Cole King, Syd, and Young M.A. Check them all out below along with my reactions. The Weeknd has to be one of the most visually interesting artists out there. His videos are always something worth watching, and he continues that tear with “Party Monster”, his latest single from Starboy. The video’s heavily influenced by the 80’s with all sorts of neons, VHS effects, and overlays. The nostalgic aesthetics are pretty dope and the song isn’t bad itself. Young M.A had a real big 2016; exploding onto the scene with an undeniable NY sound, aesthetics, and rapping ability. She tries to carry that momentum into 2017 with her latest single, “Get This Money”. It too is unapologetically New York from the production to the posse video. I was skeptical at first, but I can’t deny she has something special about her, and has a real ability to spit, which is severely lacking amongst a lot of today’s up and comers. Just like his rising Brookyn peer, Dave East is trying to bring back that calssic NY feel to his music. Coming with his own posse video for his latest single off his very dope Kairi Chanel debut, “30 N***az” is essential NY rap and it’s nice to hear it coming back in some sort of way. I had heard the name Cole King before, but I never gave him a listen, and that’s a shame because if his previous work sounds anything like this here then I’ve seriously been missing out. “Let My Heart Break” is such a dope song and his mix of singing and loose rapping on it make it really pop. The video has some great shots and plays with the contrasts of the light and the dark in interesting ways. It’s clear he’s got a creative flair to him, I need to check more of his stuff out. Can’t believe it’s been a year since his passing. He was such a legend and pioneer that I didn’t fully appreciate until after he was gone. But he did leave us with some new stuff before he left, and “No Plan” is a haunting song and video that gives a look inside the mind of a man who knows his time is coming up. He really was special. The hardest working man in hip-hop is back at it with another visual to one of his songs off one of his twelve projects (that’s right twelve) to drop last year. It’s the typical visuals for him, in the studio, smoking, and rapping. Nothing out of the ordinary, but the song itself really knocks, and he gives his partners their own time to shine as well. Man I still remember Dutty Rock absolutely having the early 2000’s in a choke hold. It still gets play from me to this day. Now he may not be nearly as big as he once was, but every now and then he can still hit us with some heat; as evidenced here with “No Lie”. The video is typical music video affair but the song itself really goes. I’ve been seeing this face popping up on my feeds for a while now, and I didn’t know why. I should’ve guessed he was a DJ of sorts, but this is the first I’m hearing of his music and “Summer” is alright, albeit a bit cheesy and generic. The video is cheesy as well, portraying that cliche Americana skating rink love story. If you haven’t heard The Internet yet, and their incredibly dope Ego Death then wtf are you waiting for? You’re missing out on some incredible vibes. The breakout star from that group seems be preparing a solo project of her own and if this is any indication for the rest of the project, count me as extremely excited. “All About Me” is just pure fire and the video gets me hype. I recently stumbled across Cage The Elephant and so far everything I’ve heard from them has been pretty damn good. “Cold Cold Cold” has a very Stones feel to it and that’s not a bad comparison to have. The video for it is damn crazy with all sorts of symbolism and fascist styling. They’re quickly gaining a fan here. L’Orange and Mr. Lif dropped one of the more intersting hip-hop albums to drop in 2016. “The Gentle End” has a unique throwback feel to it with it’s classic East coast snares and kicks. The video is an interesting look at the escapism that headphones can give. One of the most creative/artistic duos out there.